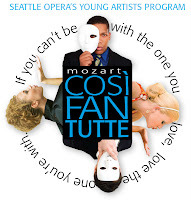 Seattle Opera’s Young Artists have begun staging rehearsals for their fall touring production of Mozart’s Così fan tutte. The tour, which stops in several Washington communities, kicks off November 11 in Walla Walla. The music of Così wasn’t new to the singers on day one of rehearsal—they all arrived in Seattle already knowing their arias and recitatives. This allowed them to spend the first few weeks of the program working with diction and vocal coaches to make sure they “understand the musicality and really know the music,” said tenor Alex Mansoori, a returning Young Artist who’s singing Ferrando (alternating in the role with Bray Wilkins). 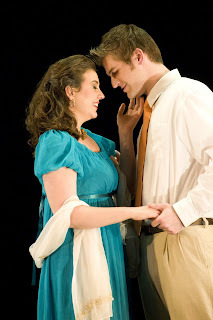 Mansoori is one of two singers who have previously performed their roles; Vira Slywotzky, who alternates in the role of Fiordiligi with Marcy Stonikas, is the other. In addition to Così rehearsals, the Young Artists have also been attending and performing at events like BRAVO! Club’s welcome party and this week’s board meeting. Check back next week for more on the happenings at the Young Artists Program! 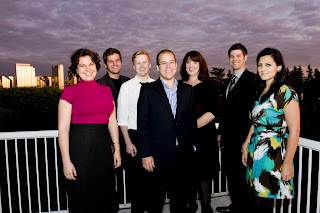 2009/10 Young Artists (left to right): Vira Slywotzky, Michael Krzankowski, Eric Neuville, Alex Mansoori, Marcy Stonikas, Erik Anstine, and Maya Lahyani. Not pictured: Bray Wilkins. © Rozarii Lynch photo.